This is Part Two of Chris's epic interview. You can read Part One here. 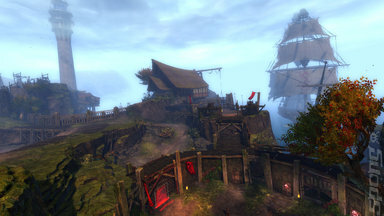 SPOnG: Guild Halls are to make their presence felt in Guild Wars 2. Can you tell us about them? IC: We haven't gone into a ton of details about Guild Halls, but there is some stuff I can tell you about. Guilds are a really important pillar to the Heart of Thorns expansion. Mainly it's the first word in our game's name so we want it to be a big deal. SPOnG: Yes that always confused me a bit. Guild Wars also had the same word in it yet I couldn't really see much evidence of them in that game, which is still going I'm happy to say. IC: Ha! So true, but MMOs are fun when you play with other players and it's been a big challenge for us to make playing with other players more fun. So we want to build on that, we want to give players more tools to get themselves more organised and we want to build for them a place for them to go. This is what Guild Halls are: they are not just a place to go but a place to live and breathe and build and own and tools for players to organise and play. We will see more of that coming when we dive deep into Guild Halls. It will be a very big feature for us. It will be an important part of the game as like I said we know it's the first word in the name of our game and we're going to push on that. 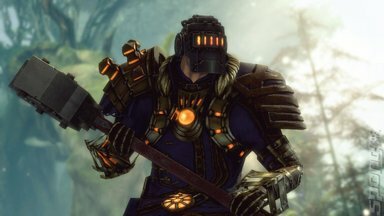 SPOnG: Guild Wars 2: Heart of Thorns is set in a jungle environment. Knowing that Guild Wars 2 has always had an interactive environment, such as the platforming sections that allow players to reach areas by jumping from one platform to the next, what have you done with the environment in Guild Wars 2: Heart of Thorns? IC: When we thought 'jungle' when we first decided we were going for that, we were trying to think 'what does jungle mean?'. Some of the things that immediately come to me are danger; a really dense area with multiple layers and so this is what we translated into the environment. We really tried to push verticality more than we ever have because it gives you a sense of danger - when something is up high things can come from under you and grab you. These really give you an opportunity of not knowing what's around. We can also make things feel dense with trying to figure out what's going on with all of these different layers. This has got us that feeling of jungle in an MMO. SPOnG: It can be claustrophobic can't it, at least in parts? IC: It can a little bit, but you have it be dense, then open up. We found that it created some of the Masteries out of this. When we first built the world we didn't have gliders. We saw how the trees were really tall and asked 'what do we do with these?'. Falling off of them is really hard and not fun so what do we do? Then gliders came along and we're like 'this is awesome'. It really is a meshing between the dangers of the environment and how to solve those dangers with the Mastery system. It really makes a fun area to live and breathe in, to feel the longer you are there the longer you master the enemies. SPOnG: I was also thinking along the lines of traps or hazards in the jungle? IC: Oh yes there's definitely traps and hazards and what-nots and ambushes. 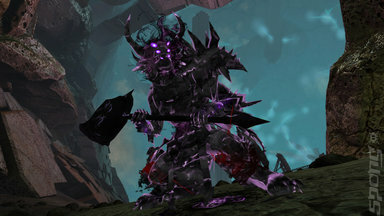 SPOnG: That's the thing about Guild Wars 2 I have always liked, in that dangerous-looking areas are genuinely hostile to the player, unlike other MMOs that typically create decoration. IC: Another thing too is that we want to make Heart of Thorns harder right? So we find our skill system really excels when things get more difficult. So because we want the jungle to be scary and dangerous then we will make the area more difficult. We'll make the creatures harder and we'll have these pockets of big difficultly and these are big goals for us.